Rigid Marine M-Series LED Light Bars are the perfect solution for the customer who wants powerful, bright, and reliable light. Rigid's patented Hybrid optical system continues to lead the field in efficiency and projection. This patent is one of my reasons that the competition simply doesn't stand up to the quality and performance of Rigid Marine M-Series LED Light Bars. By using the latest Cree and Osram LEDs, USA Made Rigid Marine M-Series lights project more than twice the amount of light at the same power. Top it off with the fact that Rigid LED Lights come with a lifetime warranty and the choice is clear. The part number for this item is 804512. 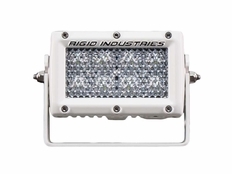 This is a 4" LED Light Bar / 60 Degree Diffused Floodlight.Click on the "specs" tab for additional information. So what is Rigid's "Diffused Pattern?" Well, Rigid's engineering team integrated a polycarbonate diffused lens into these LED Lights to offer a 60 degree flood light pattern that is perfect for scene or area lighting.